The need to make changes to a sports venue can sometimes lead to headaches for those responsible – particularly when they are dealing with a limited space. The changes can be required for a number of reasons: improvements for supporters, regulatory adjustments and safety upgrades are just some. While these create few problems for prestigious sports clubs, others will require support from trusted and knowledgeable partners. Harrod UK was recently called upon to provide a solution to such an issue. As official goal post and net supplier to England Hockey, Harrod UK was proud to support the Now Pensions Men's Hockey League and Investec Women's Hockey League play-off final weekends at Lee Valley Hockey and Tennis Centre. 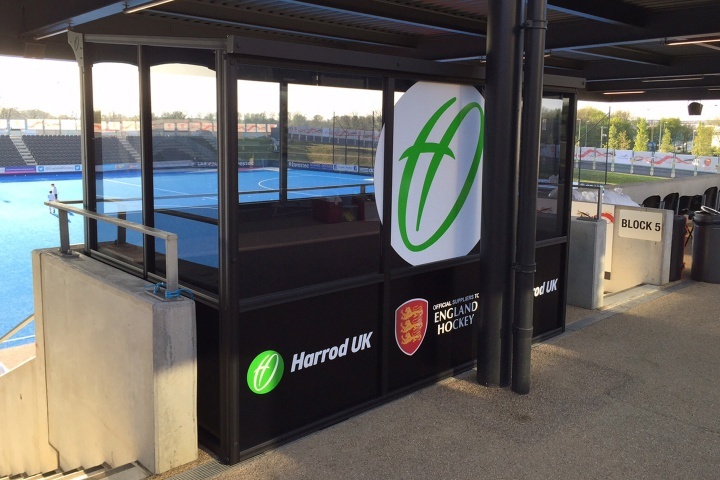 Harrod UK, which has already supplied the venue with hockey goals and team shelters, installed new technical shelters on each pitch for the events, as well as new team benches and suspension seats for the main pitch. Hockey is one of the few sports in which technical officials, including reserve umpires, remain pitchside during high level competition. This feature of the sport gave Harrod UK the opportunity to further demonstrate its status as industry leaders of sports equipment manufacturing, by providing a technical dugout specific to each pitch based on the space available to use. The technical shelter used on pitch 2 was based on a design used at the Glasgow 2014 Commonwealth Games, while the shelter on pitch 1 was a completely bespoke design, due to the space constraints around the main pitch. This new design required a creative solution for a unique problem and our Research & Development department was called upon to come up with an answer. We are proud to say that the R&D team again came up trumps. Both play-off final events were held at the Olympic legacy venue, the men's play-off finals over the 11th and 12th April and the women's over 18th and 19th April, and saw the culmination of two season-defining competitions. The first part of each day played host to the promotion play-off competition, with the winners of the North, East and West conferences battling out with the ninth-placed team in the Premier Division in a round-robin style tournament. The two highest-placed teams after Sunday's final round of matches gained promotion to, or maintained their status in, the Premier Division, while the bottom two would remain in their respective conferences for another season. The afternoon's matches showcased the Premier Division's top four finishers in a knockout style tournament to determine who would win the league championship title. In the men's competitions, Holcombe and Canterbury won places in the Premier Division for 2015/16 while Wimbledon overcame league winners East Grinstead in the final to win the Play-off Championship. All eight matches were played to an extremely high standard and the player of the weekend was 18-year-old Australian Blake Govers, who netted five times in the final and six times all weekend. In the women's competitions, Surbiton beat Canterbury 2-1 to win the Investec Women's Hockey Championship final.